GalileoGalilei is a Legacy Library. Legacy libraries are the personal libraries of famous readers, entered by LibraryThing members from the Legacy Libraries group. » Galileo Galilei's legacy profile. GalileoGalilei is also an author. 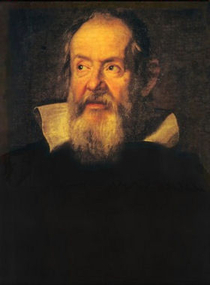 » See Galileo Galilei's author page. About meGalileo Galilei (15 February 1564 – 8 January 1642) was an Italian physicist, philosopher, and mathematician. He was also an accomplished astronomer whose observations impacted greatly on the Scientific Revolution during the Renaissance period. About my libraryIn the last years of his life, Galileo Galilei's library was located at Villa Il Gioiello on the outskirts of Florence. Under the restrictions of house arrest, he was forbidden to write or publish his ideas. However he continued to received visitors right up to his death and it was through them that he remained supplied with the latest scientific texts from Northern Europe. With his past experience, Galileo may have feared that his collection of books and manuscripts would be seized by the authorities and burned, as no reference to such items was made in his last will and testament. An itemized inventory was only later produced after Galileo's death, when the majority of his possessions including his library passed to his son, Vincenzo Galilei, Jr. On his death in 1649, the collection was inherited by his wife Sestilia Bocchineri. Galileo's books, personal papers and unedited manuscripts were then collected by Vincenzo Viviani, his former assistant and student, with the intent of preserving his old teacher's works in published form. Unfortunately it was a project that never materialised and in his final will, Viviani bequeathed a significant portion of the collection to the Hospital of Santa Maria Nuova in Florence, where there already existed an extensive library. The value of Galileo's possessions were not realised, and duplicate copies were dispersed to other libraries, such as the Biblioteca Comunale degli Intronati, the public library in Sienna. In a later attempt to specialise the library's holdings, volumes unrelated to medicine were transferred to the Biblioteca Magliabechiana, an early foundation for what was to become the Biblioteca Nazionale Centrale di Firenze, the National Central Library in Florence. The library remained in Nelli's care until his death in 1793. Knowing the value of their father's collected manuscripts, Nelli's sons attempted to sell what was left to them to the French government. Grand Duke Ferdinand III of Tuscany intervened in the sale and purchased the entire collection. The archive of manuscripts, printed books and personal papers were deposited with the Biblioteca Palatina in Florence, merging the collection with the Biblioteca Magliabechiana in 1861. Sources: The library of Galileo was only made possible by the work of Antonio Favaro, the prominent Galilean scholar. Favaro (21 May 1847 - 30 September 1922) was an Italian mathematician and historian of science. A professor at the University of Padua, he is best remembered as the editor for the works of Galileo (1890 - 1909), and producing several academic studies of the Renaissance scientist. The dedicated work of the Museo Galileo in Florence should also be noted. The museum's research staff have produced a detailed catalogue for the library of Galileo, comprised of volumes identified by Favaro through the inheritance records of Vincenzo Galilei, Jr. and Sestilia Bocchineri, along with the library catalogue of Vincenzo Viviani. They have also catalogued the volumes identified by Favaro through Galileo's unpublished correspondences and referenced in his manuscripts. Where possible, links to images of the digitised works contained within Galileo's library have been provided. Tags: The tags included in this library were provided by The Museo Galileo in Florence and are reflective of that work's particular discipline. Balletto fatto nel battesimo del terzogenito delle Serenissime Altezze di Toscana da signori paggi di S.A.S.